← It’s An RV, It’s A Manufactured Home, No, It’s a Tiny House! Here are some pictures from the work I did installing the subfloor. 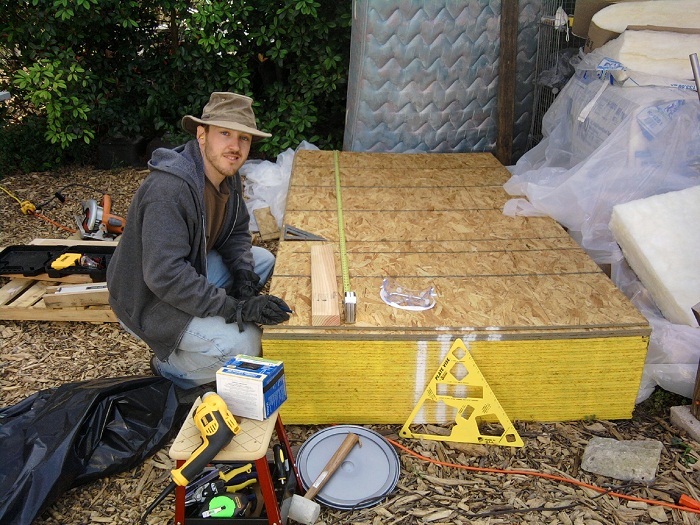 In The Small House Book by Jay Shafer of Tumbleweed Houses, he says to put metal flashing under the subfloor. 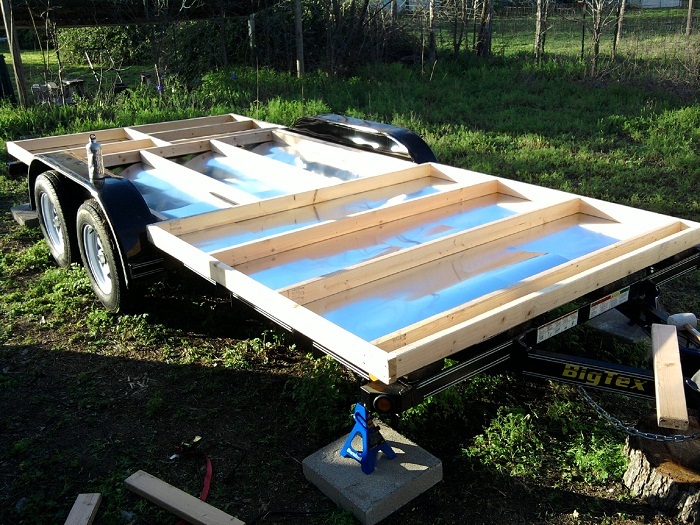 In then in a recent video of building a tiny house, they don’t do it. 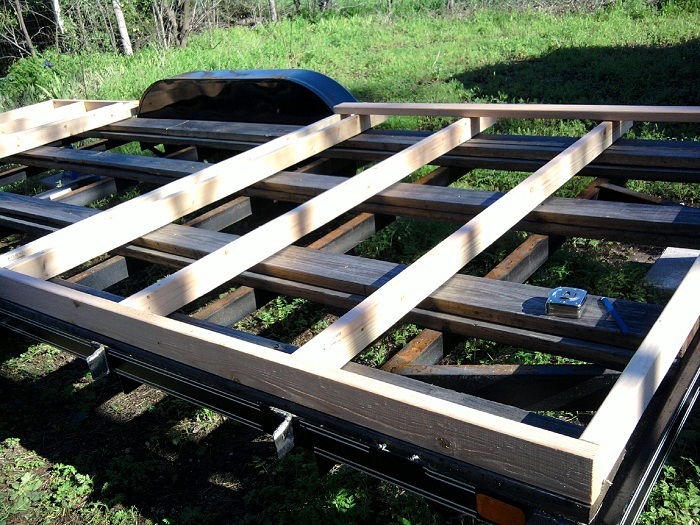 They build directly on the deck of the trailer. 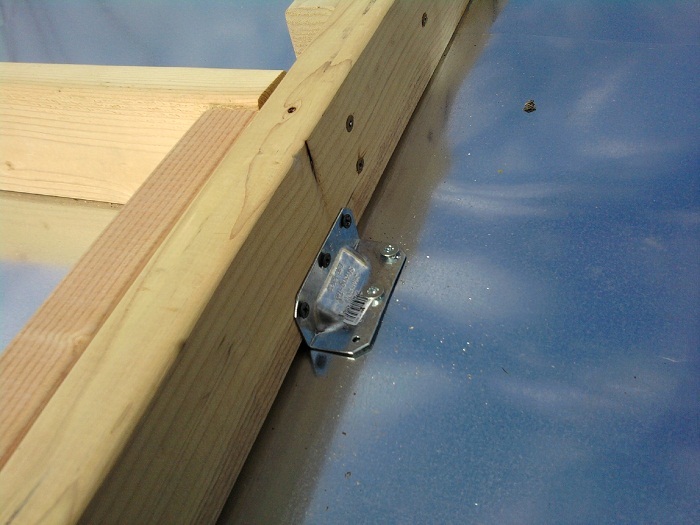 The stated purpose of the metal flashing was to keep water and bugs out from under the house. Given how tedious it was to install, next time I’ll probably leave the decking and cover it with roofing felt to repel water and keep out bugs. Surely it will do an adequate job. Then I cut and added the R-19 insulation. Turns out that according to the structural standards I read about in Building An Affordable House, 24″ between studs is just fine even though most people still use 16″. 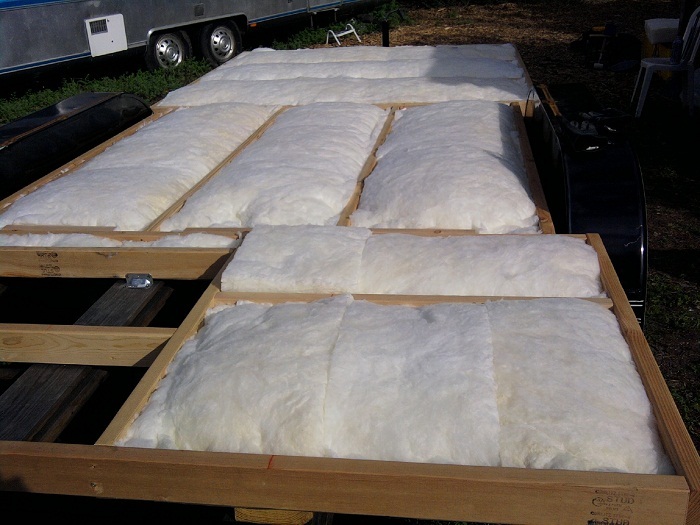 The only issue I’ve found with that is that they manufacture insulation for 2″x4″s in 16″ widths instead of 24″. 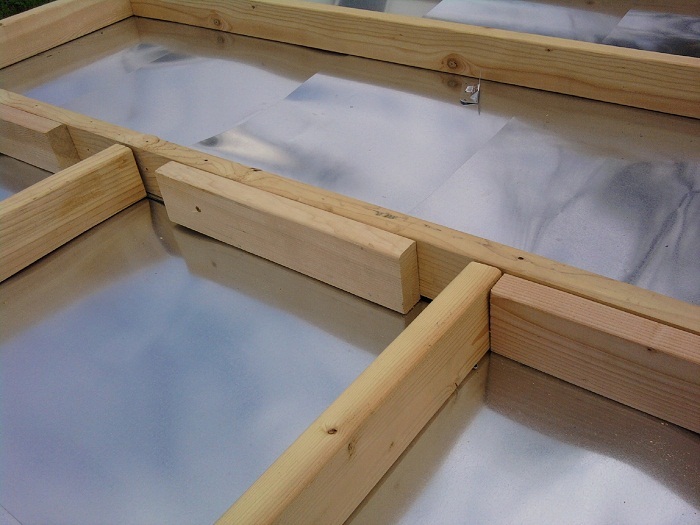 The 24″ wide insulation is made to fix between 2″x6″s. So there is a little compression of the insulation. I googled the issue and all I found is that it might not work quite as well. 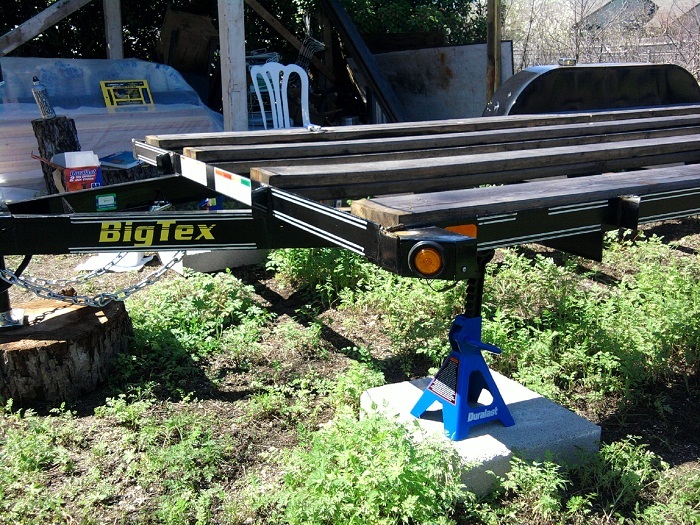 This entry was posted in Building Techniques, Planning and tagged insulation, metal flashing, subfloor, tiny house, trailer preparation. Bookmark the permalink. I love his tiny houses! And admire anyone who can live with so little ‘stuff’. I have too much stuff! 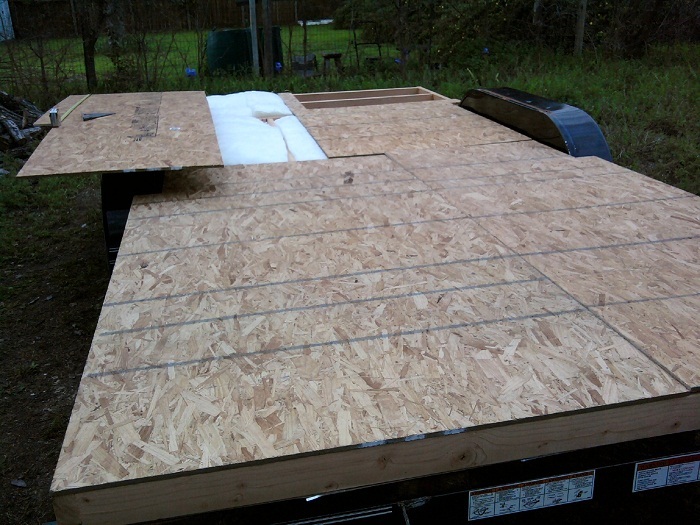 Are you worried about osb possibly getting wet? I was looking at using it but my friend that is a contractor said it would balloon up if it got wet. 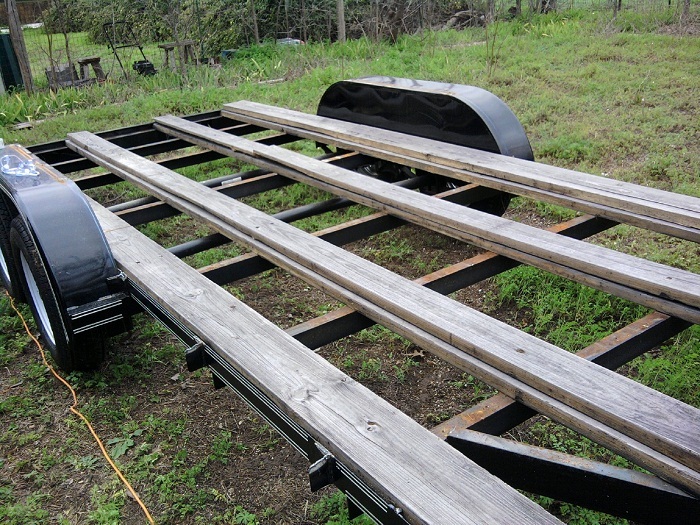 My wife and I pick up our trailer in two days to start construction on our XS house. and I am trying to learn anything I can. Any words of wisdom to share? The question is how would it get wet? If you’re planning to drive it in the rain you’ll want it protected from underneath with the metal sheeting that’s recommended. If you’re worried about rain in general then make sure it’s not overly exposed on the edges. It’s not hard to bring the siding down to cover it. 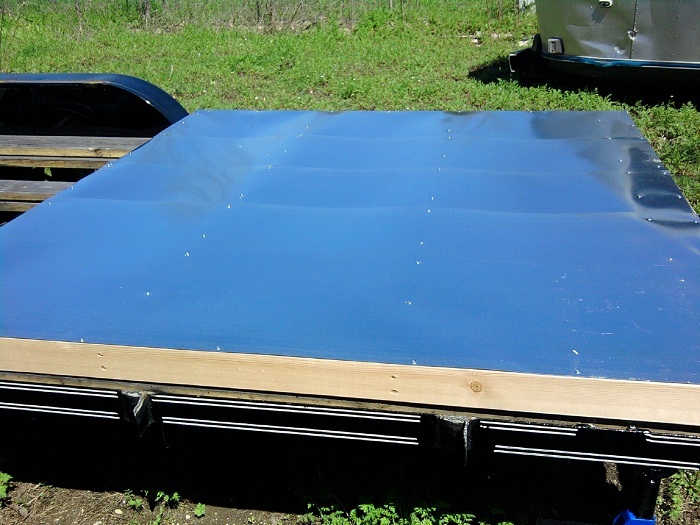 OSB is used for this purpose and does have some water resistance. Just make sure to get it thick enough for your use. I originally used 7/16″ which is for walls. I had to put two layers for the floor to stop the squishy result. I should have used either 5/8″ or 3/4″ for the floor and I could have done one layer. 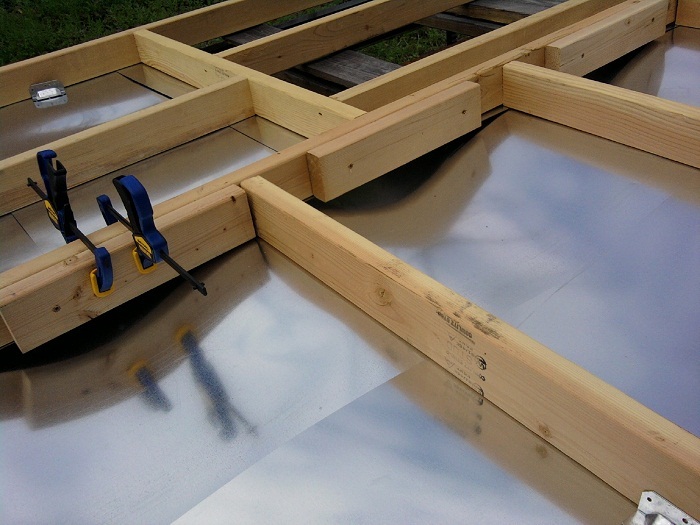 Where did you buy the metal sheeting? 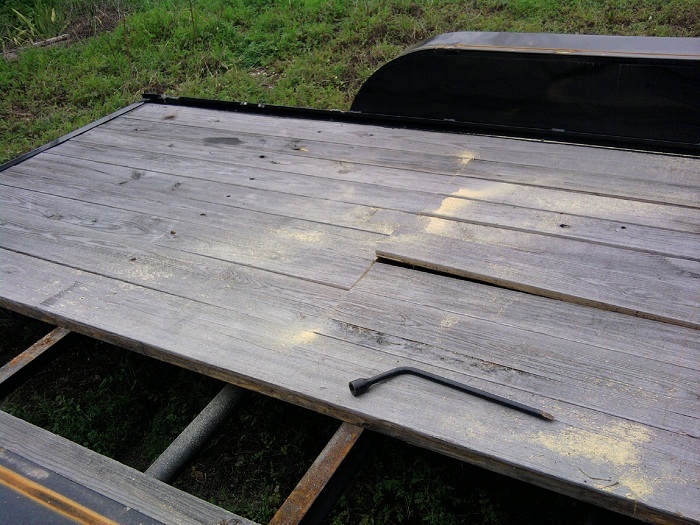 It’s all I need to start my subfloor! I got mine at Lowe’s. Any home improvement store should have it. It comes in rolls and you may have to cut it. I used a metal blade on a circular saw after getting tired of trying snips. Wear tight eye protection if you do. I was wearing safety glasses and a hot metal shard still hit the bottom of my eyebrow somehow.